In CAN networks the underlying transport protocol sets structural limits to the system in standard applications. CAN currently manages a 1 Mbit/s transmission rate, given that the overall network cable length does not exceed 25 meters. If longer lines are necessary, the transmission rate must be reduced – the longer the distance, the higher the speed loss. However, with suitable topology components, high bandwidths can be realised even in large networks. Specific benefits of various solutions are outlined here. Can I Implement stars, decouple segements, or connect copper and optical fiber with CAN bus? CAN repeaters primarily serve the physical connection of two or more segments of a CAN bus system. Additionally, they allow for the implementation of tree and star topologies and long stubs. Repeaters and star couplers do not in general influence the real-time behavior of a system. An application scenario: three pitch controllers in a wind turbine shall communicate with the Master controller via CAN. The standard line topology of CAN is not equal to the task. 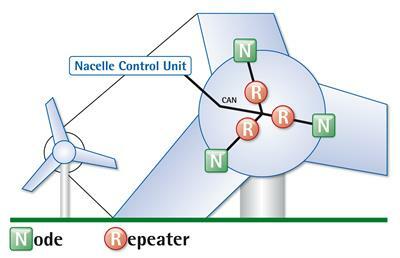 However, a CAN repeater enables star connections to the individual wind turbine blades. It also establishes galvanic isolation and thereby improves lightning protection. In case of unexpected failures in the network, faulty segments can be taken off the network by means of an integrated monitoring function in order to maintain reliable communication between the other network participants. As soon as the failure has been repaired, the restored segment is reconnected without interruptions. CAN systems linked via a repeater represent autonomous electrical segments with optimum signal termination – thus, topologies can be realised which would be impossible with a simple linear bus topology for the danger of electrical reflections. Among other things, the integrated filter function allows for messages to be filtered before being converted from one network to the other in order to keep the bus load in the particular networks as low as possible. Bus arbitration of system subsections takes place absolutely independently, which enables the higher maximum network size mentioned at the outset. Building automation is an area where CAN bridges are employed particularly often, namely to connect distributed subnetworks. In buildings it is particularly important that installations can be flexibly adapted to ensure that CAN communication works smoothly with typical line topologies with limited stub lengths. Radio transmission may be implemented in applications where communication by wire is difficult, such as rotary tables. In this case, IXXAT CANblue from HMS, which enables CAN data communication via Bluetooth, can be used for coupling. Data transmission occurs on layer 2 and is transparent. Therefore, this solution can be used with various CAN-based protocols from CANopen or DeviceNet to customer-specific variants. If several CANblue units are employed, the devices can be coupled dynamically. Is Bridge-building between protocol families possible using IXXAT components? 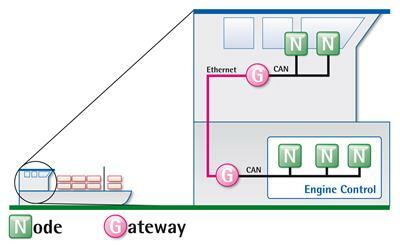 Gateways such as the CAN@net II/Generic from HMS allow for CAN networks to be easily connected to other network types, in particular Industrial Ethernet. This network coupling method in bridge mode is often employed if the two networks to be connected are not immediate neighbors. This kind of CAN bridge may be used on ships to connect higher-level controllers with CAN networks in order to enable efficient communication between the motor controller and bridge control. This bridge operating modus requires two CAN@net II/Generic devices. CAN messages are exchanged via TCP/IP; if required, filter tables can be filed. A comfortable PC tool with automatic device recognition is available for configuring TCP/IP communication parameters. The bridge function is implemented and the CAN configuration parameters are entered via a webserver implemented on CAN@net II/Generic. 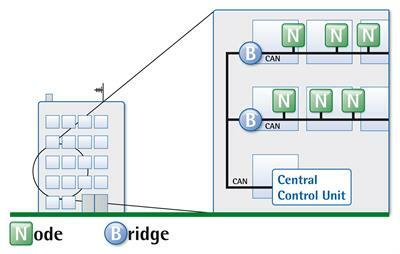 However, bridge solutions serve not only the connection of CAN and Ethernet. Many applications require devices to be connected to CAN networks via a simple RS-232 interface. 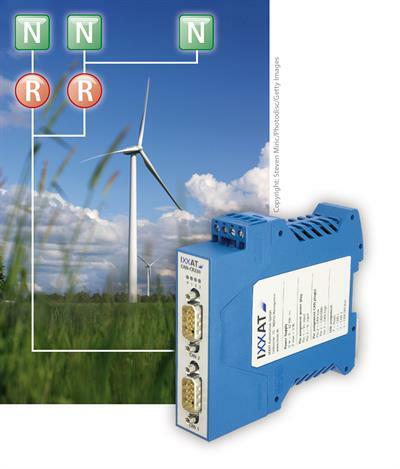 The CAN-GW100/RS-232 gateway is a comfortable solution for connection to the bus in CAN or CANopen operation mode. Technical implementation happens in CAN mode (layer 2); the received CAN data are transparently transmitted via RS-232. The data sent via RS-232 are packed into telegrams. There is one configurable identifier each for sending and receiving CAN data. In CANopen mode, CAN-GW100/RS-232 functions as a CANopen participant. Serial data are archived as byte stream objects in the manufacturer-specific object directory section and transmitted via PDO. LC Automation supply HMS network communication products including IXXAT, Anybus and Netbiter - with all the advice and support you may need. If you would like further information, don't hesitate to call LC Automation on 01254 685900 and our Industrial Network Application Engineer will be happy to offer advice and to help specify the correct products for your application.